A bronze plaque commemorates lighthouse keepers and their families for their contribution to maritime safety in the Tasman Island region from 1906 to 1976. 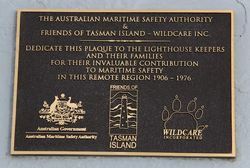 The plaque was produced by the Australian Maritime Safety Authority (AMSA) at the instigation of former keeper Karl Rowbottom, who is a volunteer with the Friends of Tasman Island (FoTI). This group is one of over 80 volunteer others which form Wildcare Inc, Tasmania's largest incorporated volunteer organisation caring for wild places, wildlife and cultural heritage. FoTI works in partnership with the Tasmanian Parks & Wildlife Service (PWS) who administer Tasman Island, which is now part of the Tasman National Park. Volunteers visit the island on working bees several times a year, carrying out maintenance, conservation and restoration work on lightstation buildings as well as the natural environment. The lighthouse remains operational and is maintained by AMSA. The lighthouse was first lit in on 2 April 1906, automated in 1976 and keepers subsequently withdrawn in 1977. Lightkeepers and their families, living in such remote areas around the coast, played an important role in maritime safety.. 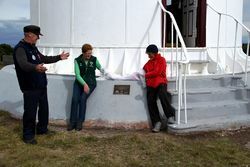 The photograph of the unveiling of the plaque shows the former Keeper at Tasman Island, Karl Rowbottom (on left) with Elaine Bell who is the great grand-daughter of the first keeper on Tasman Island, George Johnston and his wife Jessie. On the right is Carol Jackson, who spent her childhood at lightstations on Tasman Island, Eddystone Point and Low Head and is the daughter of lightkeeper, Jack Jackson and his wife Val. 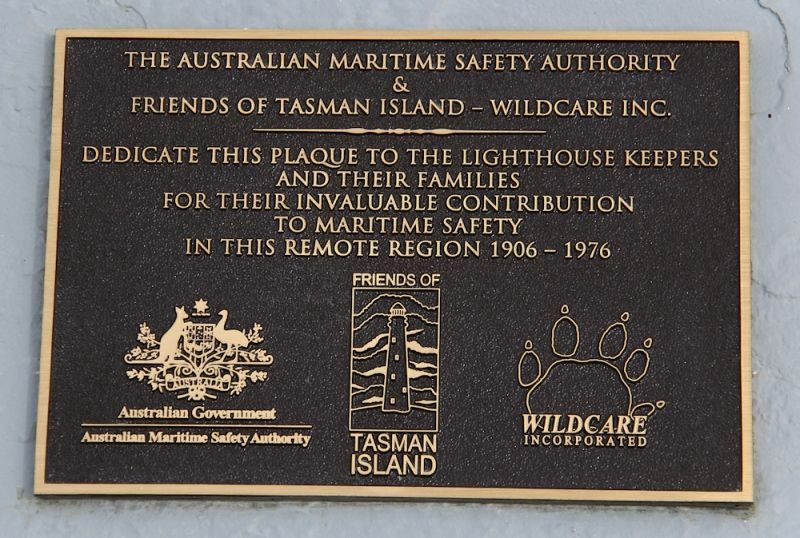 THE AUSTRALIAN MARITIME SAFETY AUTHORITY & FRIENDS OF TASMAN ISLAND - WILDCARE INC.